“There are mountains in central Alabama?” My intrigue turned into a Cheaha State Park weekend getaway. Nightfall and a pushy headwind created navigation challenges on the twisting mountain road, with multiple S-curves and steady ascents. Ramping upwards, sparkling silver stars peeked from darkness, welcoming us to this secluded, thickly-forested haven. Your weekend experience awaits, complete with hiking, history, and southern comfort food. Dominating the landscape of the Talladega National Forest, Mount Cheaha rises 2,407 feet above sea level. 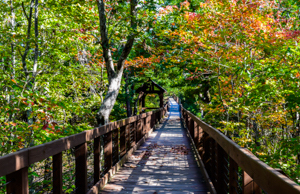 Cheaha State Park, opened in 1933, is Alabama’s oldest continuously operating state park. Travel east from Birmingham, Alabama, or west from Atlanta, Georgia, to reach this scenic state park in less than two hours. Upon arrival, stop at the Country Store and Gift Shop for overnight check-in. Whether you are purchasing firewood, securing hiking maps, picking up picnic supplies, munching boiled peanuts, or panning for gold, this is the central hub of human activity. 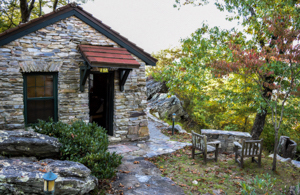 The four bluff-side cabins are the most secluded of the many accommodations at the park. Western-facing terraces are ideal for nature’s evening entertainment — the sun transforms from goldenrod yellow to fiery orange hues, and then settles gently with crimson glows above distant hills and valleys. These one-room cabins, constructed in the 1930s, feature native timbers, slate, and sandstone. The indoor plumbing, kitchenette, and air conditioning are modern-day conveniences, contrasting historic simplicity. Cabins are limited, so reserve early for the best selections. In addition, the park offers primitive camping sites, RV camping areas, chalets, and even a hotel for overnight guests. Modest grocery selections are available in the Country Store. The cabins and chalets feature well-equipped kitchenette areas, outdoor grills, and terrace fire pits. You can also dine in the park’s on-site restaurant. Known for sweeping views from the dining room or outside patio, the restaurant serves a full dinner menu complemented with local vineyard wine choices. Breakfast and lunch meals are served buffet-style. True to the mood of the park system, casual attire is appropriate in the restaurant. Catering is available for group meals. This 2,799-acre mountaintop region indulges a broad range of interests. 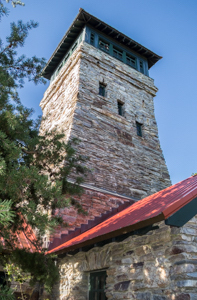 Bunker Tower, previously a fire lookout, attracts visitors of all ages to ascend into the clouds for 360-degree views of the forests, towns, and countryside. Near the tower, Bald Rock Trail is the easiest trail in the park. The wooden boardwalk parallels the original trail, ending with expansive views at the exposed gray-toned Bald Rock. 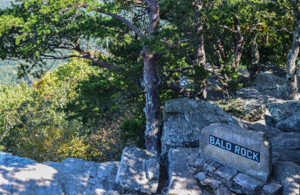 Nearby, Pulpit Rock Trail overlooks the expansive Talladega National Forest. A popular repelling destination, this red-blazed trail demands careful footing and steady balance on boulders and tree roots, but is worth the effort for impressive scenery at the trail’s end. History buffs delve into the past at the Civilian Conservation Corps Museum or the Walter Farr Indian Relic Museum. Birdwatchers, fishermen, photographers, and nature enthusiasts appreciate the park’s diverse wildlife and plants. This haven is a quiet, soul-restoring place. The rocky exteriors contrast the softness of abundant mosses. Wildflowers dot the paths and roadsides. Sunshine peppers through the trees, dancing on the ground in the thick forests. A choir of birds heralds chirping songs. Autumn leaves playfully tumble as crisp breezes round the mountaintop and travel onward. The park entrance fee is $4 per person, with discounts for children and seniors. There are seasonal discounts for camping and the Family of 4 Annual Pass is available for $125.